The world needs some consolation right about now! Babies are being starved to death in Yemen by our nation’s allies. A journalist was murdered and his body dismembered by those same allies. College students are massacred in a California nightclub for no apparent reason. Hurricanes have decimated city after city. The ironically named town of Paradise has burned to the ground. And the air is so polluted that we are being advised not to breath it! And so, we find ourselves asking, “When will it end? And where is God?” Regrettably, the answers are not apparent. Now, as bad as things are today, things were no better in Jesus’ day. And his disciples undoubtedly had the very same questions that we have. They looked around them and saw the oppression and cruelty of the Roman Empire, and every so often they must have despaired. Believe it or not, Jesus’ prophecy about the destruction of the Jewish Temple and the end of the age was meant to provide encouragement. For reasons beyond my understanding, the editors of the lectionary have included only the start of Mark, chapter 13, only the bits about doom and gloom. What Jesus says provides us hope only when understood in a larger context. So, I will do my best to fill in the gaps and provide that context. Today is the third Sunday of Advent. It is traditionally called “Gaudete Sunday.” Gaudete is Latin for rejoice. This Sunday’s readings are noticeably less gloomy than the readings for the other Sundays of Advent. And some parishes mark the semi-festive tone of the day by using rose-colored vestments and paraments, instead of violet ones. (But in my humble opinion, rose is just a fancy way of saying pink, and I refuse to wear pink!) But as you are probably not terribly interested in my color preferences, let’s just move on and take a look-see at those “less gloomy” readings. The first reading from Isaiah really has no hints of gloom at all. It prophesies the return of the people to Zion in the midst of a sweeping transformation almost beyond imagining. Isaiah prophesies that those who are marginalized due to disabilities will be healed and reincorporated into society. And not only will the people be transformed, even the wilderness through which they pass will become a luxuriant garden. Finally, we are told, that “they shall obtain joy and gladness, and sorrow and sighing shall flee away.” What a fitting reading for Rejoice Sunday! The context of the original prophecy was the Babylonian Exile, which was to last some 70 years. The prophet wrote this inspired poem to give hope to a captive people as they awaited the day of their return. And return they did, but the blind and the lame and the deaf and the mute were not restored to wholeness, and the wilderness was not transformed into a new Eden. The prophecy was fulfilled only in part, it seems. Christian scripture hints that there is another, deeper fulfilment of this prophecy yet to occur. We find references to this in the Gospel reading from Matthew. It implies that the complete fulfillment of this prophecy will come only at the consummation of the Kingdom of God, which began to break into this world with the first coming of the Messiah and will reach its fullness only at his second coming. Click here for a printable pdf version. The world needs some consolation right now. We need some consolation! The stories coming out of Beirut and Paris are both heartbreaking and horrifying. We find ourselves asking, “When will it end? Where is God in all this?” The answers are not apparent. Things were no better in Jesus’ day, and his disciples undoubtedly had the same questions that we have about the violence that surrounded them. They looked around them and saw the oppression and cruelty of the Roman Empire, and every so often they must have despaired. Believe it or not, Jesus’ prophecy about the destruction of the Jewish Temple and the end of the age was meant to provide encouragement. For reasons beyond my understanding, the editors of the lectionary have included only the start of Mark, chapter 13, only the bits about doom and gloom. But I’ll do my best to fit the verses we heard read today into a larger context. 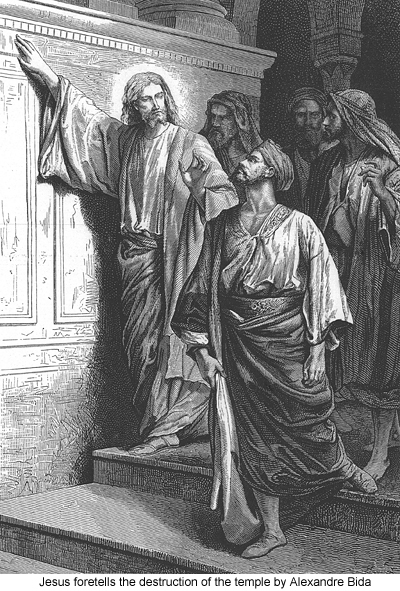 The disciples are impressed by the grandeur of the Temple. And by all accounts the Second Temple was one of the wonders of the ancient world. 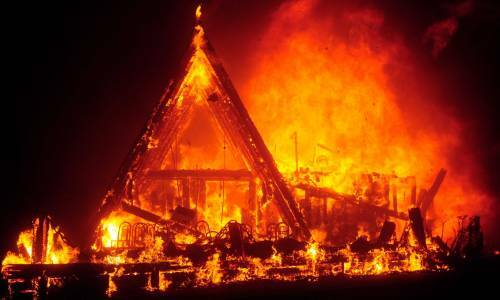 Jesus’ response is to foretell the total destruction of the Temple. I doubt that we can even imagine what the disciples’ reaction must have been. For the Jewish people, the Temple in Jerusalem was quite literally the center of the Universe. It was the seat of God on earth, the place where the sacrifice of atonement was made each year for the sins of the people. I don’t know that there is any physical structure that has a similar meaning for us. Just perhaps we might experience the same effect if we were told that in a short while the United States of America would cease to exist.